The absence of the former governor of Benue State, Gabriel Suswam at the inauguration of his successor, Dr Samuel Ortom yesterday, did not stop youths in the state from erring their minds. Prior to the inauguration, it was rumoured that civil servants in the state were planning to disgrace the former governor at the inauguration ceremony for failing to clear their outstanding wages but it was the youths who made good any threats of humiliation. Some youths were seen at the inauguration ceremony held at the popular IBB Square, Makurdi, with a black cat caged in a wired case (PICTURED ABOVE) symbolised the defeat and incapacitation of Suswam. The former governor was alleged to have, before the general elections, claimed to be a “black cat” which always invincible in the night, synonymous of his victory in previous elections against stark odds. 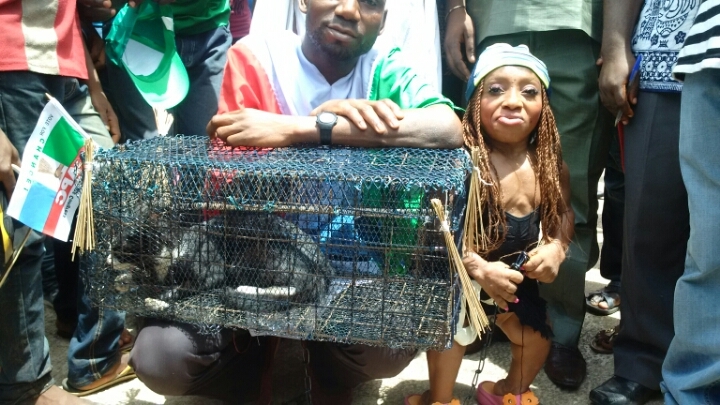 The custodians of the caged black cat were cheered as they danced through the mammoth crowd who came from every nook and cranny of the state to witness the occasion. Apart from Suswam’s chief of staff, Prof Saint Gbilekaa, key figures of the outgoing government and notable elders of the opposition PDP were also conspicuously absent to the epoch-making event.